A hot tub provides soothing hydrotherapy that relieves sore muscles, steams away stress and promotes rejuvenating sleep while enhancing your sense of well-being. In addition to providing an element of luxury to your home, a hot tub can provide a tranquil haven for your family and friends. Before purchasing a hot tub, you should consider several important factors like the available space and number of people who will use the spa regularly. This guide will help you to select the hot tub that is right for your lifestyle. The first step in buying a hot tub is choosing your location and size. The spa must fit in the available space without blocking access to doors and walkways. The hot tub requires water and electrical utilities to operate. If they are not already in place, you must include the cost of installing these utilities in your budget. The location should also provide your desired level of privacy. But most importantly, choose a location that is convenient. The closer the hot tub is to your house, the more often it will be used, the more benefits you will get. Once you have a location chosen, think about how big of a hot tub you need. How many people in your home will use the hot tub? How often will you have visitors? What size will fit well in your space? Now choose the hot tub type. They are available in a variety of styles and materials, which will determine its shape and seating configuration. The material will also be a key factor in the pool's durability and ease of maintenance. The most popular types of hot tubs on the market are made from acrylic and/or fiberglass, which conserve energy through their insulating properties. These durable, low-maintenance materials are available in a variety of sizes, shapes and styles as well as a wide range of colors and finishes. The number of seats and their configurations will vary with the size of the pool. The hollow shell conceals the piping, heating filtration and water jets inside the base of a fiberglass or acrylic hot tub, which are accessible through a door on the side of the unit. These lightweight pools can be installed on a patio or deck. Some of the least expensive hot tubs are rotationally molded spas. They are made using a really interesting manufacturing process whereby a heated mold is filled with plastic and then rotated around until the plastic fills the shape. The result is a light weight spa that does not require additional internal support material. They are easy to clean, bacteria resistant and may be more environmentally friendly than other spas. 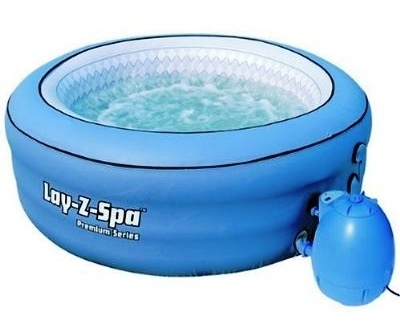 Rotomolded spas are typically found at many big box retailers such as Home Depot and CostCo. Wood hot tubs are typically constructed using cedar, a strong, naturally water-resistant material. The wood has a smooth surface and emits a pleasant aroma. 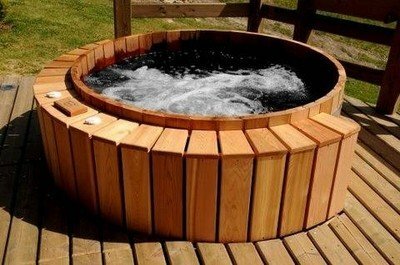 Crafted in a similar fashion to barrels, traditional cedar hot tubs feature a stave and hoop design. While the horizontal hoops secure the staves in position, they allow these vertical slats to expand when wet creating a watertight seal. Cedar hot tubs can be installed on a deck or patio. Although wood provides a luxurious look, the material does not last as long as fiberglass or acrylic. Preformed, integral seating is usually not available. A wooden hot tub requires an external heating unit and is not equipped with internal water jets. Wood, fiberglass and acrylic hot tubs can be difficult to move due to their size and shapes. If you need a portable hot tub, consider an inflatable model. Made from vinyl, these hot tubs inflate and deflate with the assistance of a motorized air pump. Extremely lightweight, these pools are suitable for indoor and outdoor use. Once it is inflated, you hook up the hot tub's external heating and filtration units. The most affordable pools on the market, these hot tubs are also the least durable. An excellent option for people on a limited budget, inflatable hot tubs are available in different shapes and styles. Along with the type of hot tub, there are several other issues to consider when selecting the best pool for your needs. In addition to the pool's energy efficiency, other factors include power requirements, features and maintenance. 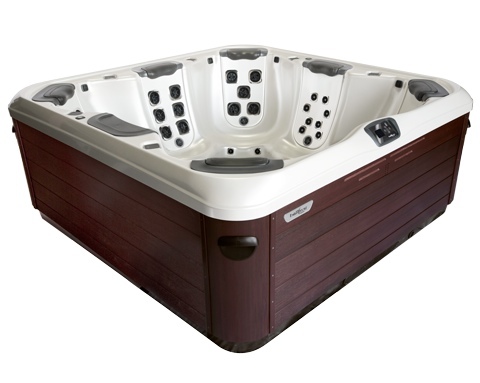 US hot tubs come with 2 different power requirements: 120 volts and 240 volts. Hot tubs using 240 volts heat up quicker and can support more jets. Hot tubs using 120 volts are easier to hook up, making them more portable. Most medium to large size acrylic swim spas are 240 volts. Many Rotomolded hot tubs are 120 volts. Evaluate the hot tub's features. The thermostat and controls should be easy to understand and operate. Determine whether the tub has a single air bubbler or individual jets for each seat. If jets are available, verify that they are adjustable to customize the massage experience. The spa should have an automatic shut off for additional safety. In addition to soft-cushioned interior surfaces, the tub should be deep enough for tall individuals. A wood hot tub typically requires more maintenance than pools constructed with synthetic materials. Consider how much time you want to devote to cleaning and maintaining the spa. The hot tub should provide easy access to the pump, filter and other plumbing. When calculating the cost of operating your spa, evaluate the cost of supplies, such as filters and chemicals. Some units are easier and less expensive to maintain than other models. Protecting your spa with a cover reduces the level of required maintenance by keeping dirt and debris out of the tub. Measure the available space and determine your budget. Evaluate the makes and models that fit your criteria. 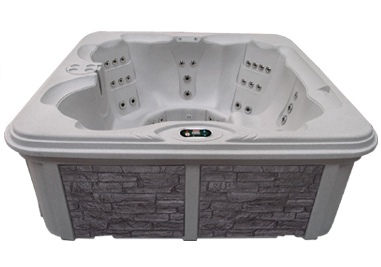 With the wide assortment of hot tubs on the market, you will find a model that provides the optimal mix of seating, must-have features and ease of maintenance for your lifestyle.